This recipe will serve 4 as a side dish or 2 as a main dish if accompanied by a large salad. We cooked this recipe in a large covered baking dish in the microwave oven in about 20 minutes. 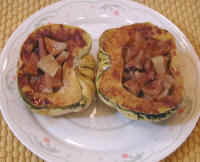 The stuffed dumpling squash can also be baked in a conventional oven at 350 degrees F. until tender (about 40 minutes). Begin by washing and cleaning the dumpling squash and apple. Split the dumpling squash in half from top to bottom with a large knife. Scoop out the seeds with a metal table spoon (we save the seeds for roasting as a tasty snack). 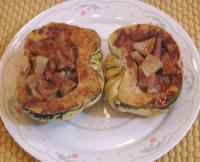 Place the dumpling squash halves in the large baking dish with the skin side down. Place about a tablespoon of raisins in each seed cavity. Cut the apple into quarters and remove the core and seeds. Slice the apple, and cut the slices into small pieces as shown in the photo and place some in each cavity. Mix the apple pieces and raisins together, and place additional apple pieces on top so that they mound up slightly. Pour some apple juice over the apples to fill each cavity, and sprinkle each stuffed half with cinnamon. Cover, and bake in the microwave or conventional oven.